Diospyros the Greek word for "food of the gods" is also the botanical name for persimmon. In Japan, where the persimmon is wildly popular, the word for the fruit is kaki. Japanese botanists oftentimes use the phrase Diospyros kaki when speaking about the Japanese persimmon. The Japanese persimmon that has become the dominant variety sold in the United States originated in China, and one of the traditional foods eaten during the Japanese New Year. A sub-tropical plant, the persimmon grows well California and the Southeastern United States. 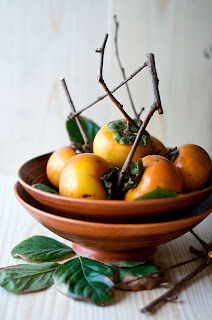 Sometime in the mid-1800s the first persimmon cultivar arrived in California. The two types most commercially available are the Hachiya and Fuyu—with the Hachiya dominating 90% of the market. It is an astringent fruit, bright orange in color, and shaped like a large, slightly elongated tomato that almost comes to a point at the bottom. Hachiyas must be fully ripe or soft to the touch to be enjoyed. The taste is compared to that of a sweet, ripened apricot with a smooth, slippery texture. The Fuyu, also bright orange in color, is non-astringent. It is eaten when firm, just like an apple—shiny skin and all. You can recognize a Fuyu by its squat shape, and flat bottom resembling the appearance of a medium-sized tomato. Nutritional content. The Fuyu is about 118 calories with 31 grams carbohydrates. The Hachiya has 32 calories and 8 grams carbohydrates. Both varieties contain about 6 grams of fiber. The two varieties seem to be nutritional opposites with some of the data. The Hachiya has 16.5 mg of Vitamin C, while the Fuyu contains 12.6 mg. Another opposite is the potassium content of the Fuyu with 270 mg versus the Hachiya that has only 78 mg. Fuyu contains 13 mg and the Hachiya has only 7 mg of calcium respectively. Fuyu persimmons contain a whopping 2733 IU of Vitamin A and 425 mcg of beta-carotene. Unfortunately, there are no Vitamin A figures available for the Hachiya. However, if color were any indication of the presence of beta-carotene, the Hachiya's bright orange color would indicate its availability. The Fuyu contains a good profile of B vitamins—especially B6. Other antioxidant values in the Fuyu feature 2431 mcg of cryptoxanthin beta, 267 mcg of lycopene, and 1401 mg of lutein and zeaxanthin. 1. Cubed in oatmeal for breakfast with a dollop of 2 % Greek style yogurt. The sweetness of the persimmon plays deliciously against the creamy tanginess of the Greek style yogurt. 2. Farmer’s Market Sliced Persimmon and Arugula Salad with Dijon Mustard Lemon Olive Oil Dressing. Peel and finely slice a persimmon then toss with 2 cups of arugula. For dressing 1 tsp. Dijon, 1 T. fresh squeezed lemon, and 2 T good quality extra virgin olive oil. 3. Persimmon and Greek style yogurt. This is my favorite fall harvest lunch. Peel and cube a persimmon, then fold into 1 cup 2% Greek yogurt. I like adding ½ tsp. pumpkin pie spice and a few chopped nuts such as pistachios or toasted pepitas.